I have only a tribute for my Friday Favorite- My Papa George. My Papa and I were almost born on the same day. Fifteen minutes was all that separated us from sharing May 15th as a birthday. I used to always see him on/around our almost-same-birthdays. Today would be his birthday if he were still around. I miss him so much. He was a wonderful, spirited, loving Grandpa, and I always felt lucky I got to spend so much of my life sharing our almost-same-birthdays with him. I wish my children could have spent time with him, but sadly he passed away a little over a year before Drew was born. Of course now my children have their own spirited, wonderful, loving Papa. And this makes me very, very happy. Love you, Dad. Okay all- now tell me- what are your faves? You can blog some FF's and then link back if you so choose, or leave them in the comments! How fortunate you were being able to get to know him. 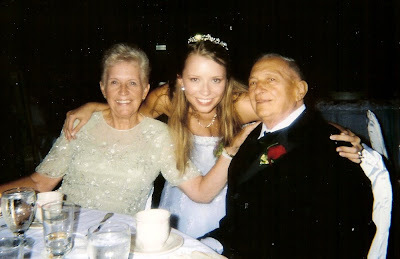 I only met one of my four grandparents, the others passed away before I was born. Your Friday Favorite was a great tribute to him. Happy belated birthday. happy friday to you...and what a great memory to share with us!!!! How sweet and a great way to always remember him, on his birthday!! Happy Birthday, Papa George! And happy belated birthday to you, Janna, hope you had a great day yesterday. What a special relationship you shared with your grandfather. Drew looks so happy on your father's lap. What a sweet photo! Very nice....stopping over from sits. I wish I would have known mine a little better. :( its ok though. have a great day! belated birthday wishes :( hope it was great! My great grandmother and I were a day apart in birthdays as well, although I can say I have no idea the actual minutes that separate us! :) I hope you had a wonderful birthday!